The Wyoming Department of Transportation ( Wyoming DOT ) deals with matters related to vehicles, including registration, looking up driver licenses, titles, and plates. These services offered by the department are aimed to provide ease and security to the public. Anyone who has access to a computer, tablet, or smart phone can utilize the online service through their official website while others can have their queries answered in person at the office. To begin a Wyoming License Plate Lookup online, use the form above. Each individual search has a charge of $5 which needs to be deposited along with the submission of the MV-220 Title Search form. This form consists of sections related to applicant and vehicle information, type of application, and abandoned vehicle information. The details required to be mentioned in the first section, Applicant and Vehicle Information, are the applicant name, their daytime phone number, mailing address, email address, city and state they live in, the make of the vehicle in question, and its model, body style, and color. The license plate number should be mentioned too along with expiry date, if applicable. If you know the state the license plate is from, mention that as well along with the title and name of the owner, if applicable. The remainder if the form includes further details and state requirements and norms to which the request is addressed. If you are looking for a certificate of title, you can request the Wyoming Department of Transportation for it. However, the request must contain some basic information to process the request. This includes the vehicle identification number, title number, legal owner’s name, with at least one of these details needed to be mentioned. Those who want to look up a license plate must submit a request containing the plate number of the concerned vehicle and mention its type, whether it’s a passenger car, a motor cycle, or a truck. The request should also clearly state the make and year of the vehicle against which the search is being conducted. 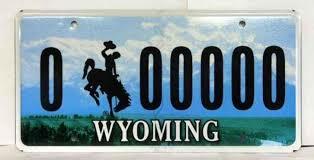 State supported searches for license plates are also processed under the Wyoming DOT. However, it must be clearly mentioned in the application that the search is being requested on behalf of state authorities. The form needs to be submitted in person at the office of the Wyoming Department of Transportation. The department can be contacted through phone on (307) 777-4883, (307) 777-4710, or (307) 777-4709. Their office is located at 5300 Bishop Boulevard, Cheyenne WY 82009. If you have any more queries or are looking for any other services from the Wyoming DOT, visit their official website. Im about to buy a car abd beed ti know that its not stolen. We are happy to assist you with a Wyoming license plate lookup or a vehicle record search by VIN check however, finding out if a vehicle is stolen is not something we can assist you with. You will want to reach out to the Wyoming Department of Transportation directly and inquire about this vehicle via it’s Wyoming license plate number or vehicle identification number.